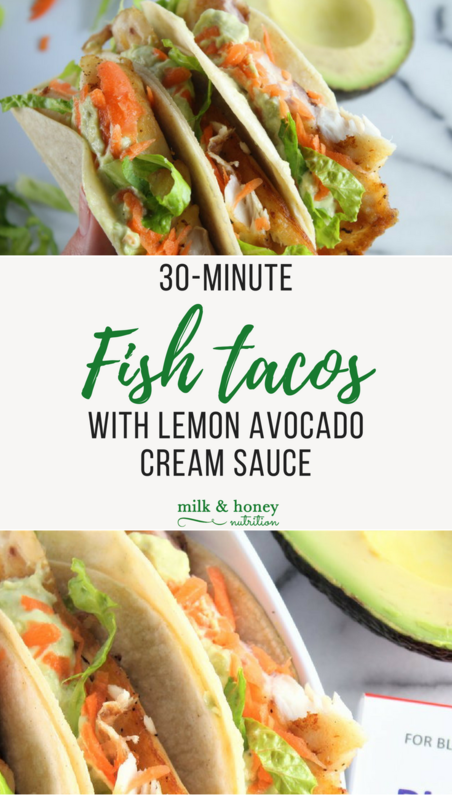 I developed this recipe for 30-minute Fish Tacos with Lemon Avocado Cream Sauce after we found out I have a food intolerance to chicken and shrimp. (Read more about that here.) These tacos are super simple to make, and so delicious! This recipe was sponsored by Pinnertest. All thoughts and ideas are my own. If frozen, defrost snapper filets, rinse, and pat dry. Season with salt and pepper. Heat 1-2 Tbsp avocado oil in a cast iron skillet over medium high heat. Once the skillet is nice and hot, add the snapper filets and cook for 4-5 minutes on each side. Set aside. In a medium bowl, mix the avocado, lemon juice, yogurt, and spices until well blended. Lay our tortillas/taco shells and fill as desired with snapper, lemon avocado cream sauce, lettuce, and carrots. Enjoy! Check out these other great dinner recipes!